As the field of data management service providers in agriculture becomes increasingly crowded, more attention is being paid to companies that can provide a tangible return on a farmer’s investment. This is an approach that Kansas-based Farmobile is taking with a new data monetization pilot program, called Data Store. The company plans to collect field data on 250,000 acres of Minnesota farmland and develop Electronic Field Records, or EFRs, that will contain one year’s worth of detailed planting and harvest data notes. In this video, I share a clip from an interview I had with Farmobile founder and CEO, Jason Tatge. Tatge speaks about the pilot program and the level of control farmers will have with their data. Once stored, the farmer-owned data can be shared with dealers, agronomists or crop insurance agents. But the platform also allows farmers to sell a licensed copy of their data. The pilot program will allow farmers to sell completed EFRs for a guaranteed return of at least $2 per acre, according to Farmobile founder and CEO, Jason Tatge. The initial cost for the data collection program is $1,250 per year with a 3-year subscription, which covers the cost of the machine-agnostic hardware installed on a farmer’s machinery. 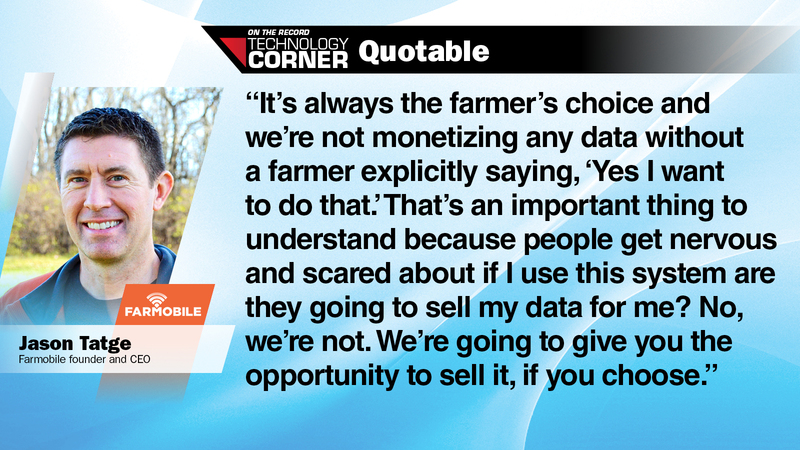 While the company guarantees a minimum $2 per acre return for data sold through its platform, any profit beyond the $2 is then split 50/50 with the farmer and Farmobile.